Leather Holder for 6" DMT Stone - ONLY £6.99 - SAVE £1! DMT Bench Stone Base - ONLY £14.99 (+VAT) - SAVE £1! A popular sharpening choice, DMT Diamond Whetstone sharpener is a fit at home or in the shop offering a sharpening surface to satisfy a variety of edge care needs. Coarse diamond (45 micron / 325) to quickly restore a neglected edge. Size: 6" x 2" x 3/4" (152mm x 51mm x 19mm). 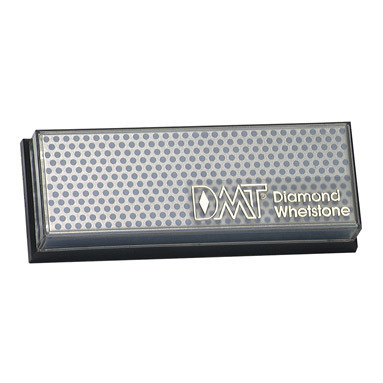 This 6" Diamond Whetstone sharpener comes in a durable plastic case with mounting capability. Sharpening with diamonds is fast and easy. No messy oils needed-sharpen dry or with water. Easy counter or bench use. Larger, wider diamond surface for sharpening a variety of knives and edges.